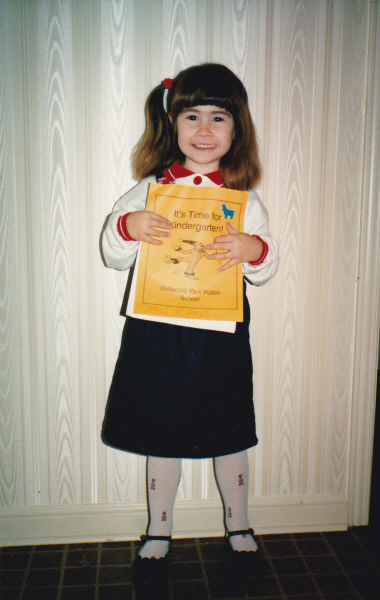 The next member of the LitWorld team to share a favorite read aloud memory is Megan Karges, our Dot Connector and Social Media Coordinator. "Growing up I spent most of the summer at a cottage on Georgian Bay. Every night my sister and I, and any of our friends that happened to be visiting, sat on our bunk bed listening to my dad tell the latest adventures of Corky and Fritz. He made these stories up on the spot, and fully committed to their delivery. It was a read aloud, it was a performance, it was a spectacle. Corky's laugh was a hybrid of Woody Woodpecker and some unknown creature. A dinosaur perhaps. Naturally Fritz had an eccentric sense of humor to trigger Corky's infectious laugh, which caused a chain reaction of giggling from the captive audience. The off-the-wall adventures of this bumbling pair kept my sister and I laughing throughout the winter while we waited for July, and the chance to catch up with old friends."